We recorded in two different places. Honolulu and at Palehua which are both in Hawai’i but a bit different. That’s a different story. He had been up at Palehua for some many days and I had been working on for many weeks what I thought was a break-through. Late one of the recording nights, he was tired and worked all days on many tracks and wanted to sleep, but I insisted that he stayed in the room and listen to one more song that he had never heard…… for me it was the key to his new life. In Palehua you have a fireplace or you’ll perish, if your boney like me, “it gets cold” just under 3000 ft elevation …….IZ was perfect. Israel took his shirt off and sat there with a perfect core temperature next to the fire place looking East at the city lights. That was Palehua ……… I’ll never forget it. It was about a little after midnight ………. Once I started playback, I turned away from Israel so he could experience it himself. At the end of the song…… I started to become aware of Israel and turned, he was shaking, trembling. I didn’t know what to think at first. Is he having a stroke, heart attack?……………. Turns out he was just crying uncontrollably. It was so him………….. He was more beautiful than you could ever imagine. The next morning we took the majority of the Facing Future cover photographs in the front yard of Palehua, a sunny day. THIS MUST BE WHAT HEAVEN SOUNDS LIKE. Every time I hear Hawaii 78 I cry buckets. Iz’ voice, the words and all the music stir me very deeply. Deep to my very core. I relate my reactions to this recording as being the tears of our ancestors and even to the tears of current day ‘kanaka maoli’ all of our hearts are fractured, hurt deeply, but we will prevail. Mahalo to our brother Iz who spread the message of our broken hearts – the true Aloha spirit. Discovered and fell in love with Iz’s music in the 90’s. The most sincere and heartwarming voice, ever. 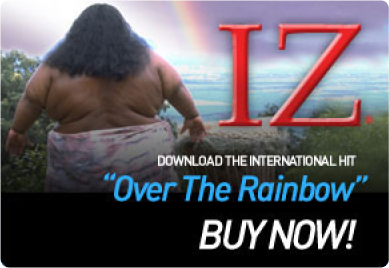 I love Hawaii and the lovely memory of Iz.. His voice will live forever. I am a hawai’ian at heart, as Iz says in one of his songs. I visited the Islands 3 years ago. I left a part of myself there and I swear on all that is dear to me that I shall return. This song never fails to move me deeply. I sing along with Iz when I play his CDs but when thissong comes on, I cannot bring myself to disturb this wonderful work. Bruddah Iz, I never knew you but I miss you deeply. muchas Mahalos to you guys for sharing this wonderfull and emotional story. Sorry for my bad english writing but i guess my little IZ hawaii78 story should be here as well. I first heard about IZ in the german radio in 2007. Of course it was “what a wonderful world”. In september 2008 i came to visit hawaii and at my very last day i bought the song hawaii78 and put it on my i-pod. When my friends took me to the airport to leave hawaii i told them not to stay for long with me because i don`t like long goodby ceremonies. So i stayed alone with my i-pod for 3 hours waiting for bording. It was about 6 oclock when the sun starts to set when i first listened to hawaii78. sitting outside the building, sunset in my back, the beautiful view of the mountains in front and brother IZ in my ears. Every double i (end of the word hawaii) sung by IZ shot tears in my eyes emediatly. So i lost my heart in three hours crying and listening to this only song. I will never forgett what happened to me by the voice of this great man. I was deeply touched and will be forever. IZ wherever you are now i send some pryers to you. Rest in peace brother. Being a 1873 grad of Lahainaluna High school, my heart and soul are steeped in tradition, and Brudda Iz recording of Hawaii 78 ALWAYS brings tears to my eyes, but also gladness to my heart, gladness that he was able to capture the true feeling of the hurt we have suffered/are suffering, and in doing so, made what I think is the best song EVER recorded. Aloha Bruddah Iz, see you one day. It’s true that big is BEAUTIFUL and all good people will live on. Thanks IZ. This song brings tears to my eyes every time I hear it. This version of “Hawaiʻi 78” is the only version that brings me those feelings – chicken skin, yes but a lot more. For me, the influence of IZ is far reaching. I started studying ʻōlelo and hula because of the messages, feelings and aloha I received from his music. Hula and ʻōlelo have provided many opportunities to support the Hawaiian culture. The thanks I received in the past and in the future really belong to IZ. E hoʻomaikaʻi i ke Akua. I stayed 3 weeks in hawaii in sept 2008 and in this time i was blessed to meet another person wich touched my heart very deep. When i first saw MIKE KEALE (son of mo keale and cousin of IZ) there was a direct conection between me and him by the very first moment. I only met him about 3 times in this stay but even this was enough to stay in touch via the internet. when i returned back to hawaii in december 2008 for a 2 month stay it was him to meet first of all my “hawaiian ohana”. We met at kapahulu peer in waikiki where we went to the tip of the peer. mike was there with his ukulele of course (he never goes somewhere without any instrument!!!) and the very first song he played for me was HAWAII 78!!!!! … ever since he plays this song whenever we meet. No matter if it was for many times in real or after my moving back to germany via the internet (evry time he sees me onle in skype he contacts me and plays a song for me) …. i am deeply proud to have found this fantastic soul and i was blessed to shoot the cover photos for his new cd. We had a incredible time at spitting cave with some real nice sunset shots at the rocks. i cannot wait till the cd will be released in spring 2010 and i look forward to come back to my hawaiian ohana. The previous entry is from My father.. I could not agree more with him…. IZ influenced our lives throughout the years.. When I got married in 2001 it was a Hawaiian Themed wedding and IZ was played all night.. I also had my father, daughter and we included my mother dance to “In Diz Life”.. Now as a mother I share his music with my 2yo son who loves Twinkle Twinkle Little Star and When I hear “In Diz Life” not only does it make me think of my parents but it makes me realize how lucky I am to have the special lil boy who loves me. IZ you have touched my life in so many ways.. I may be Haole but I am Hawaiian at Heart and Cherish every song you wrote… Much Aloha!! Rest with the Angels! My first visit to Hawaii was in October 1997, less than six months earlier IZ had passed away but his music was playing everywhere from Waikiki to the Navy Exchange and radio. I wanted to take back to the mainland some of his music and angelic voice so I visited a Towers Records and picked up “Facing Future”. The first time I listened to “Hawaii 78” I had an epiphany, a spiritual connection if you will that felt as real as if IZ was talking directly to me. He INVITED me through his music via his ancestors to come and live in Hawaii. I knew it would be the right thing to do and it would be okay to share the aina with this haole from the mainland. It took another 7 years before I was able to transfer my job to Hawaii but it happened and if not for IZ, I dont think I would be here today. The power of “Hawaii 78” is unexplainable but real. The excitement and intensity of “E Ala E” stirs unexplainable emotion in me and the joy listening to “Wonderful World/Over the Rainbow” comforts me while “Gilligan’s Island” makes me smile. I wished I had gotten here sooner that first time to have seen you in person perform. I am and always will be Your Fan, Goodnight and may God Bless You IZ. Hi, I’m a late bloomer Male (65) and untill just a year ago after hearing “Somewhere”as a movie trailer had never heard of IZ! But, God is good and bestowed upon me the good fortune to have experienced his beautiful music and presence. I’ve been a music lover all my life, but travelled in different circles, and so, after hearing him he has yet, again opened anothers heart to Hawaii and her people and the injustice visited upon them. Thank You IZ.